1 - New Year’s Day (Año Nuevo), national holiday. Banks and public government offices remain closed. 6 - Three Kings Day (Día de los Reyes) is the traditional gift-giving day in the Mexican celebration of holidays when children receive toys and gifts in honor of the Three King’ visit to baby Jesus. 17 - Feast Day of San Antonio de Abad is a Mexican religious holiday during which the Catholic Church which allows animals to enter the church for their blessing. Visitors that come to Los Cabos during the months of late November through March will be treated to a spectacular sight of whales just offshore. Of the eleven species of whales found worldwide, eight venture to the waters off of Cabo. The ideal climate, shallowness, salinity and abundant food resources of the bays and lagoons north of town make this the perfect breeding and nursery grounds for the whales and their young. Breeding areas are primarily situated on the Pacific side, but some of these whales travel around the cape to the Sea of Cortez. Visitors on local whale watching trips are often rewarded with up-close encounters with these beautiful and gentle giants. 2 - Candelmas is a religious celebration which heralds the arrival of spring with candlelight processions, music, food and dances. The traditional blessing of seeds and candles co-mingles pre-Hispanic and European traditions and marks the end of winter. 5 - Constitution Day, national holiday and parade. Banks and public government offices remain closed. 14 - Valentine's Day (Día de Amistad); in Mexico, not just love, but friendship as well is celebrated on February 14. Special menus in fine restaurants, and live music to dance in different latino ambience night clubs. 24 - Mexican Flag Day. Mexican celebration. 5 - Carnaval Day. Carnaval is an indulgent celebration of pleasure before the sober fasting period of the Catholic Lent. The event begins the weekend before Lent, Carnaval is celebrated exuberantly with feasting, drinking, parades, and dancing in the streets. Port towns such as Ensenada, La Paz, Mazatlan and Veracruz are the best places to watch Carnaval festivities. Mid-March: Festival of San Jose - San Jose del Cabo. This festival is in honor of the city's patron saint, San José (St. Joseph). This 11-day festival culminates on March 19 every year. Beginning with evening parties and music on the 8th of March, the festival increases with carnivals and parades on weekends. Food venues are placed throughout all downtown, and booths carrying items like fresh warm tamales and sugared pumpkin candies are also available. 21 - Benito Juarez Day is a national holiday honoring the renowned former president who is known as “The Lincoln of Mexico.” March 21 First Day of Spring, and the beginning of the Springbreak season. Semana Santa and Pascua, (Easter Break); Cabo San Lucas is at its peak occupancy during this pre-Easter Holy week, a time of national vocational and “spring break” from schools. 30 - Día de los Niños (Chidlren's Day). Kids make a parade on streets and have party. 5 - Celebration the defeat of the French Army at Puebla in 1862, national holiday, Banks and public government offices remain closed. 1 - Navy Day is an official Mexican holiday. End of June, early July: Annual Stars & Stripes Fishing and Golf Tournament, a “feel-good” Cabo San Lucas event held since 1996 has helped raise millions of dollars. The proceeds benefit children in the US and Mexico. A 4-day long event that includes a fishing tournament, golf and music. 16 - Fiesta of the Virgin of Carmen: In honor of a woman who is believed to be a protector of Mexico, the festivities begin with many craft vendors on the streets. In the afternoon, a parade of school children followed by mothers with families and puppeteers come their way through the downtown streets. The bullfights also take place in the afternoon at the Toros Stadium one kilometer south of the city. A small fishing tournament run by the city also takes place during this festival day. 25 - Festival of St. James, Credited with bringing Catholicism to Mexico, St. James the Apostle is envisioned through legends as a magical man who rides a white horse. The parades and festivities held in Cabo reflect the wonder still felt by the people for this patron saint of Spain. Look for riders mounted on white horses in the parades and re-enacted battlefield skirmishes staged at the town square around dusk. The parades begin at 2pm followed by closed shops and street parties swelling from the cantinas. This event takes place throughout downtown. End of July or Start of August: Bisbee's East Cape Sportfishing Tournament held at East Cape. A fishing tournament where anglers compete for Black or Blue Marlin, Dorado and Tuna. Designed for serious anglers who love competition in a casual and convivial environment. Treasured by the people of Mexico, this event celebrates the Virgin Mary's departure from earth and into heaven. Processions begin the day (about 10am) with musical bands and floats denoting the Virgin Mary's life. Many mothers holding babies join the parade, and the locals and tourists stand by and catch the treats thrown to them from the parade participants. Scuba divers of all ages and skill level will love the Los Cabos Summer Dive Fiesta. Held in the Cabo Pulmo National Marine Park, the weeklong events include dives, gatherings and beach parties. 1 - Annual State of the Union, though this date is an approximation, the President delivers the State of the Union Address in the autumn. 8 - Dia de Nuestra Señora; This local Baja holiday celebrates Baja's first mission. Commemorated during the month of September, with the famed Independence Eve celebration taking place on the 15th. On this night, the central plaza is filled with revelers participating in the traditional grito, or Cry for Independence. The following day is a national holiday, celebrated by a parade through the center of town and continuing festivities. Mexican Charros (Mexican cowboys) parade through town in morning (beginning at 10:00 am) wearing traditional charro outfits with beautifully decorated jackets, pants and sombreros. 15 - 16: Mexican Independence Celebration in Los Cabos, The day before the Mexican Independence Day will be celebrated with fireworks, folk dancing and mariachi bands. These festivities will be followed the next day with parades, speeches, family picnics and more. Event held in Todos Santos. October 12 is the date of the festival of Nuestra Señora del Pilar, the patron saint of Todos Santos. This date is celebrated as the founding of the town of Todos Santos. There are usually activities, including a fair and live music in the plaza, most of the week of the 12th. There is dancing to live music in the evenings on the zocalo. And lots of food and drink. This day also celebrates Columbus' arrival to the Americas, and the historical origins of the Mexican mestizo race which blended the Spanish and the indigenous. 18 - Fiesta de Cabo San Lucas, is a festival which celebrates the patron saint of Cabo San Lucas. Every October 18th, streets are closed off downtown for a parade. The festival features dancing, music and food vendors. Starting October until mid-April, all along the peninsula you will be able to see the migrating whales. Many whales enjoy the warm waters of Los Cabos, including the Gray Whale, Blue Whale, Sperm Whale, Humpback and Fin Whale. Some of the whale activity viewable from shore includes breaching (jumping into the air), sounding (showing the tail fin as they dive) and spyhopping (where the whale lifts its head to the surface and looks around). 1 - 2 Día de Los Muertos (Day of the Dead) is an important Mexican holiday merges pre-Columbian beliefs and modern Catholicism. 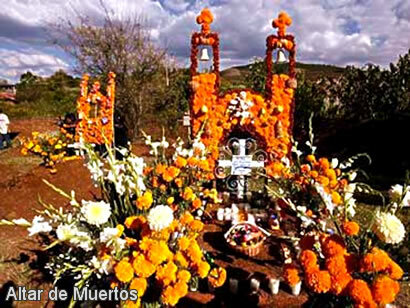 Europe's All Saint's Day and the Aztec worship of the dead contribute to these two days honoring Mexico's dead. 20 - Revolution day, on this day parades and rodeos commemorate the Mexican Revolution. Visitors who come to Los Cabos during the months of late November through March shall be treated to a spectacular sight of whales just offshore. Of the eleven species of whales found worldwide, eight venture to the waters off of Los Cabos. The ideal climate, shallowness, salinity and abundant food resources of the bays and lagoons north of Los Cabos make this the perfect breeding and nursery grounds for the whales and their young. Breeding areas are primarily situated on the Pacific side, but some whales travel around the cape to the Sea of Cortez. Visitors on local whale watching trips are often rewarded with up-close encounters with these magnificent and gentle giants. 12 - Feast of the Virgin of Guadalupe; This nationwide display of traditional culture is celebrated with street fairs, fireworks, processions, masses and more. 16 - 24 Christmas Posadaswhuch are candle-lit processions from house to house for nine days prior to Christmas enhance the excitement of Christmas in Mexico. 25 - With the rest of the Christian world, Mexico celebrates the day of Christmas.